AWPA has written to the Australian Foreign Minister Julie Bishop concerning the arrest of approximately 150 West Papuan people including children in Nabire, West Papua. The arrests occurred between the 30 June and the sixth of July. “It is pointless of governments to say Indonesia is now a democracy and human rights abuses are a thing of the past. The ongoing arrests of peaceful demonstrators prove otherwise”. AWPA has urged the foreign minister (letter below) to use her good offices with the Indonesian Government urging that all West Papuan activists, human rights defenders and political prisoners be released. Around 150 West Papuan people in Nabire arrested, including children. Many tortured. I am writing to you concerning the arrest of approximately 150 West Papuan people including children in Nabire, West Papua. The arrests occurred between the 30 June and the sixth of July. 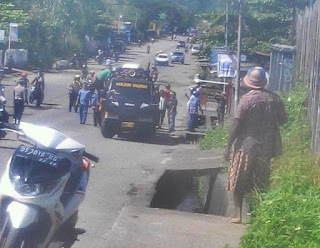 On the 30th June a West Papuan activist Yanto Waine went missing for 3 days and it emerged that he had been arrested on Mulia Road in Nabire. It was his arrest that led to a chain of events resulting in up to 150 people being arrested. On hearing of his arrest a peaceful demonstration was held on the 4 July calling for the release of Yanto Waine. This resulted in another 31 people being arrested. Although Yanto Waine was released on the 6th July approximately 150 people marched to the Indonesian police station in Nabire to call for the release of the remaining detainees. However, it was reported they were also arrested. The names of 104 people arrested have been confirmed. According to members of the West Papua National Committee (KNPB), during the arrests people were kicked, punched, and beaten with guns, and rattan canes. On the 1st May this year up to 200 people were arrested by the Indonesian police in Sentani as they commemorated the tragic event in their history when the United Nations Temporary Executive Authority (UNTEA) handed the administration of West Papua to Indonesia on the 1st May in 1963 and on the 31 May another 77 members of the West Papua National Committee (KNPB) were arrested in Merauke. It is also 19 years since the Biak Massacre. On the 6 July in 1998 the Indonesian security forces attacked peaceful demonstrators in Biak, massacring scores of people. The victims included women and children. They were killed at the base of a water tower in the town where the West Papuan people had raised their national flag. Other Papuans were rounded up and later taken out to sea where they were thrown off naval ships and drowned. No security force personal were ever charged over the killings. It is pointless to say Indonesia is now a democracy and human rights abuses are a thing of the past. The ongoing arrests of peaceful demonstrators prove otherwise. We urge you to use your good offices with the Indonesian Government urging that all West Papuan activists, human rights defenders and political prisoners be released.